One of my new favorite restaurants is Gato. I’m a big Bobby Flay fan and have been for years. It was a real disappointment when he closed Bolo several years ago, I loved the food and ambience. Gato makes up for that loss in a big way. One of my favorite small plates is Mussel and Clam Salad with Saffron Pickled Shallots. The entire dish is sublime, but those saffron pickled shallots really blew me away. I knew I had to try and replicate the recipe! 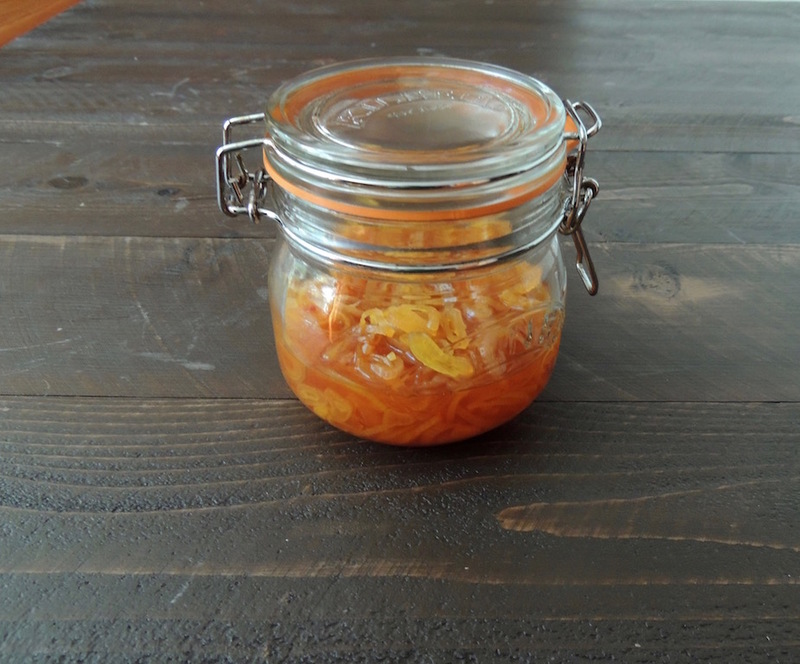 This is a quick pickle recipe and super simple to make. 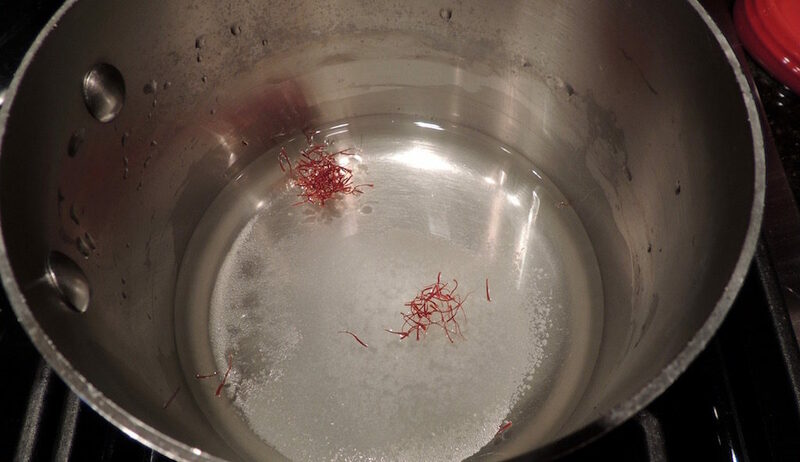 Boil water, vinegar, sugar, salt and saffron for 5 minutes. Dump in the sliced shallots and cook and another 5 minutes. Then let them steep in the pan off heat for 15 minutes. 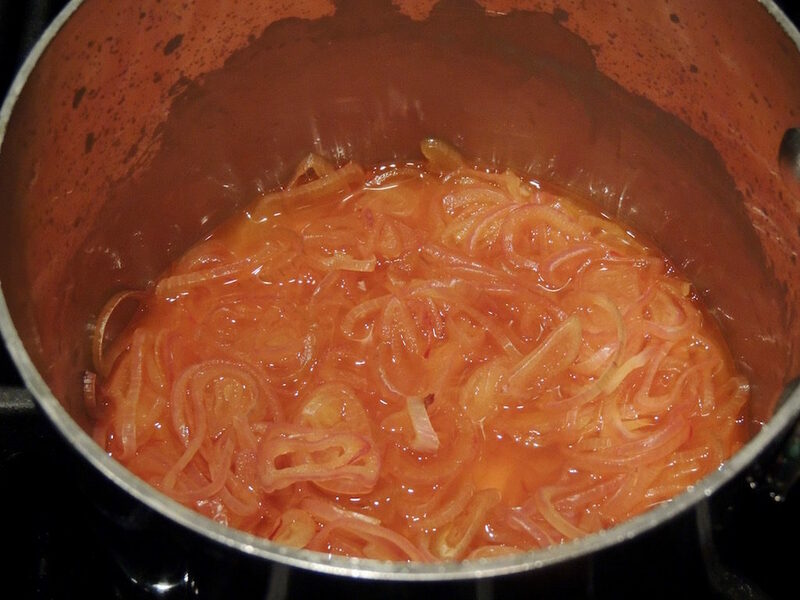 I thought these saffron pickled shallots would be a real treat on chicken liver pate and sandwiches, especially tuna. 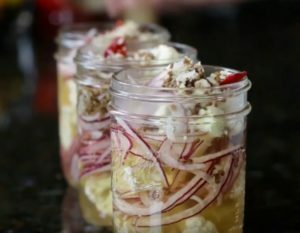 Strew a few shallots in salads and include a little of the pickle brine in the dressing. Use a mandolin or vegetable slicer to make slices of uniform thickness. These keep for a couple months in the refrigerator. Store in a mason jar or reuse an old pickle jar. Combine the water, vinegar, sugar, salt and saffron in a medium-size saucepan over high heat and bring to a boil. Once the sugar and salt are dissolved and the brine is a golden, stir in the shallots and simmer for 5 minutes. Remove the pan from the heat and let steep for 15 minutes. Place in a storage container and once completely, cover and store in the refrigerator. It isn’t thanksgiving without a cranberry dish, and the vibrant cranberry red is a welcome addition to the earthy colors of the Thanksgiving turkey and traditional sides. Cranberries are tart, so tart as to be inedible without some sweetener. This Cranberry Sauce recipe, however, goes lighter on the sugar to highlight the cranberry and complement the other naturally sweet sides, such as sweet potatoes, butternut squash and cornbread. For an interesting little twist, I’ve added a couple of Clementines. 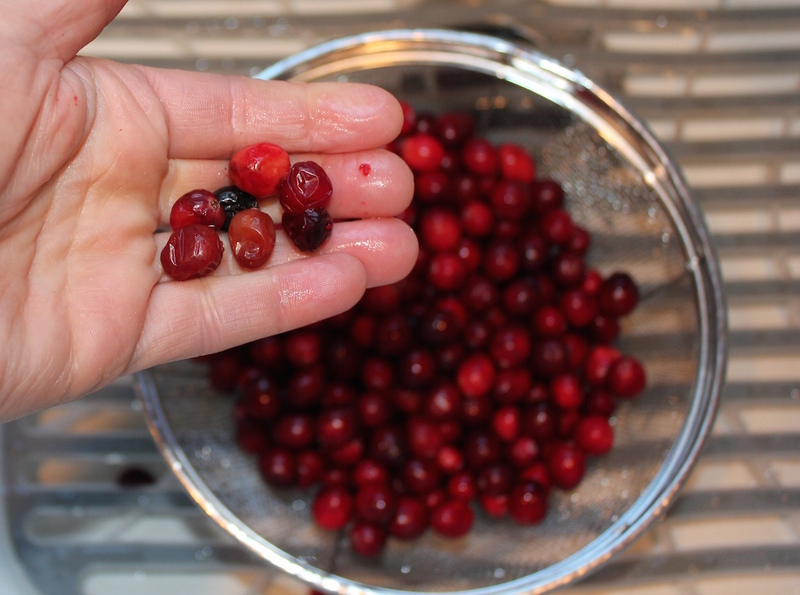 Rinse and pick through the cranberries for any bad ones. 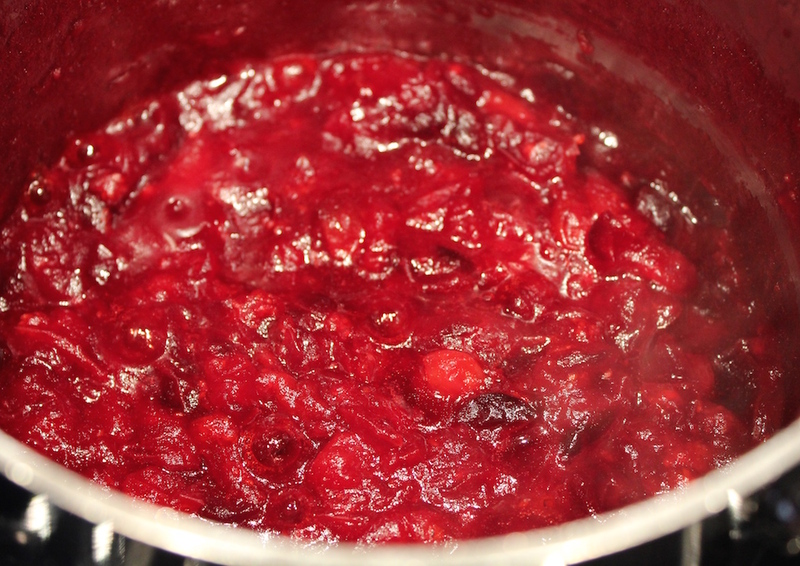 Bring the cranberries, water and sugar to a boil in a medium-size covered pot. 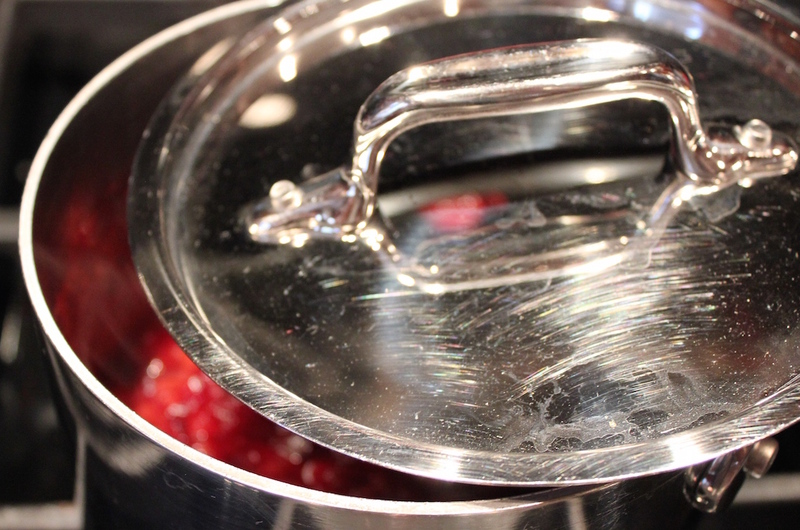 Lower the heat to a gentle boil, leave the cover ajar, the cranberries pop and spatter. 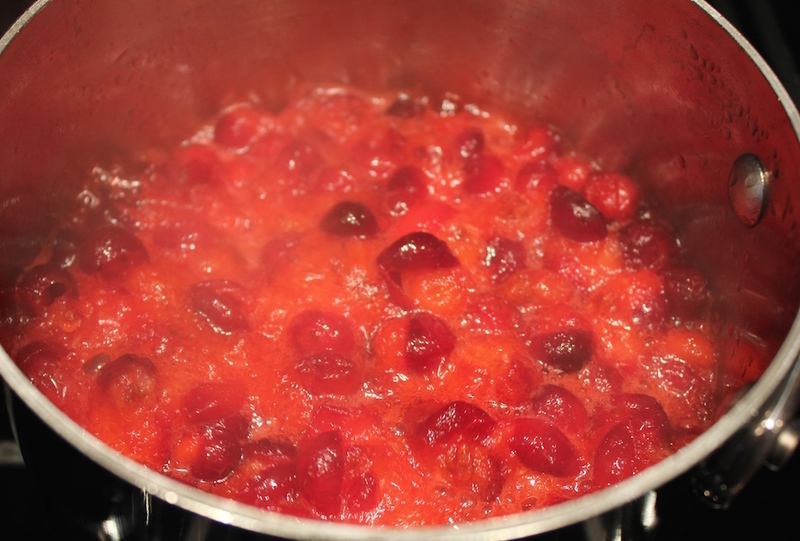 Cook until cranberries are thick, about 12 minutes. 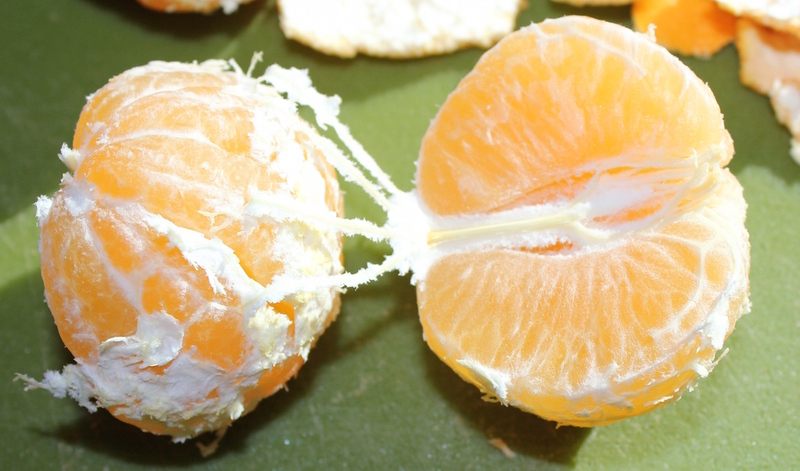 In the meantime, peel the Clementines, and remove all the pith and strings. 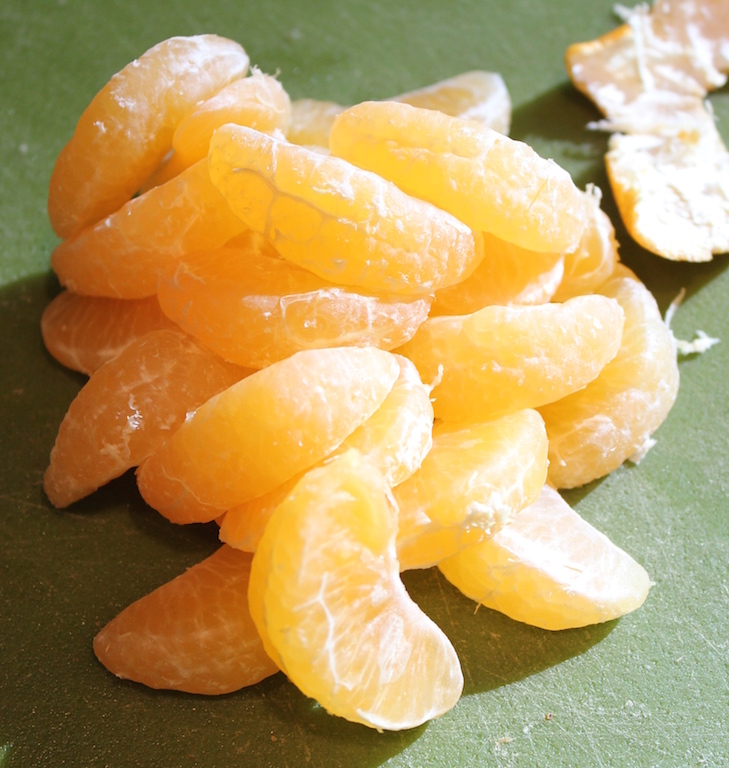 Cut the cleaned Clementines in half and stir in. A traditional recipe with a little twist. Sweet clementines with fresh cranberries make a delicious condiment, especially at Thanksgiving! Stir in the Clementine segment halves. This recipe for Garlic Shrimp Bites with Pineapple Salsa is a light, easy-to-prepare appetizer. If you don’t have the ceramic spoons shown in the picture above, use taco or pita chips. Most fishmongers clean and devein the shrimp for you. If possible, get them to remove the tail end, too. If not, just pinch until you hear a slight crack and gently wiggle it off. I prefer to use Wild USA shrimp. If you don’t have a grill, heat a medium frypan over medium-high heat and sauté the marinated shrimp as directed below. Cut the green onions on the diagonal and include the green tops, which add color and flavor. 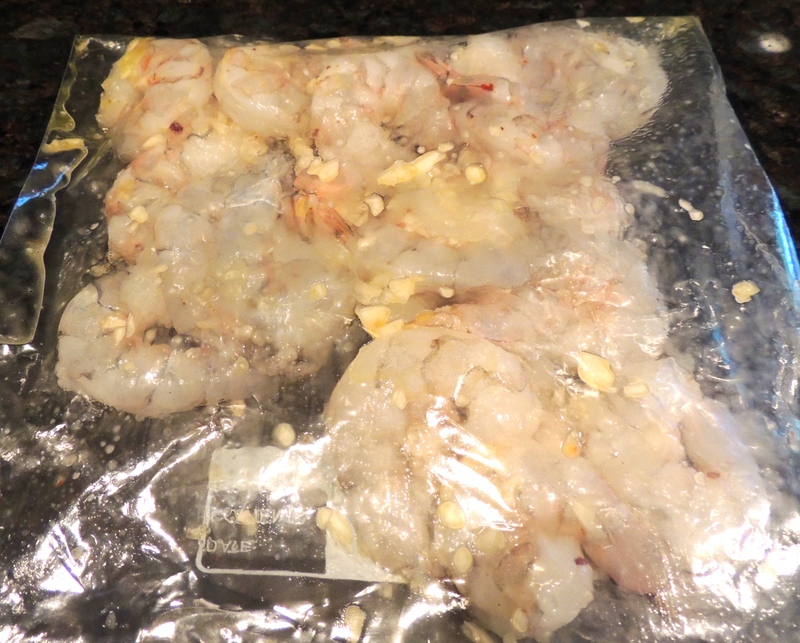 Combine the shrimp, oil, garlic, salt and pepper flakes in a non-reactive bowl and cover or a self-closing plastic bag, and chill for at least two hours. Preheat the grill. 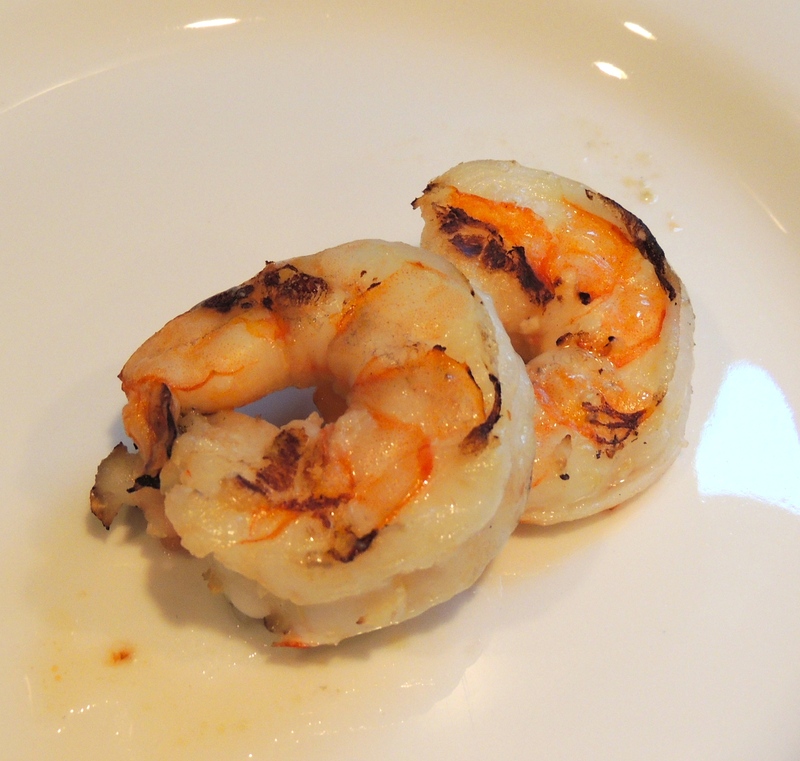 Place the shrimp on the hot grill and cook for two minutes on one side, turn and cook another one or two minutes. 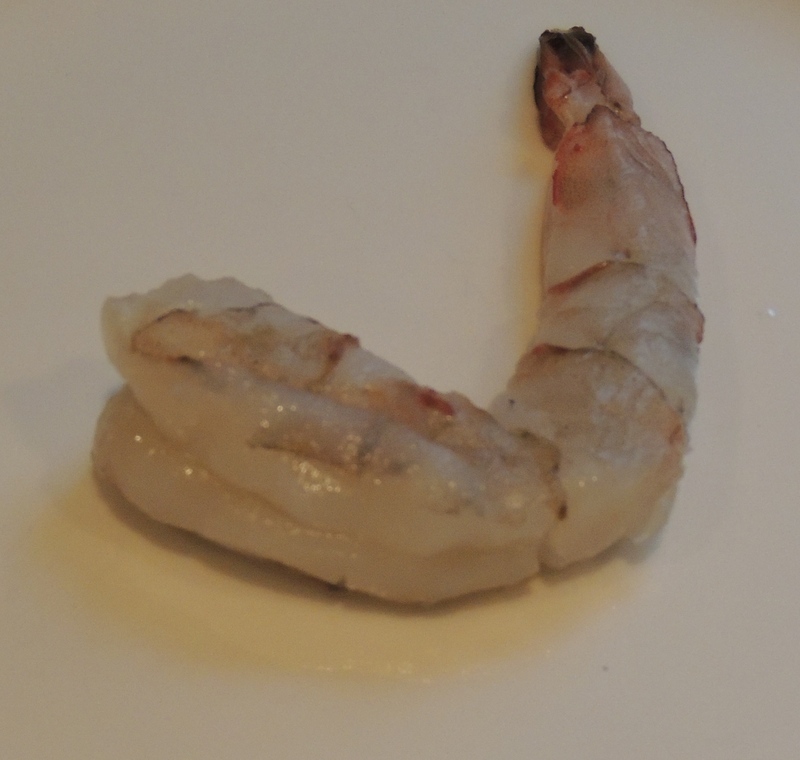 The shrimp are ready when they are pink and firm. Cut the shrimp into bite-size chunks and place one piece on each spoon or on each taco or pita chip and top with pineapple salsa. See our post on how to peel a pineapple. 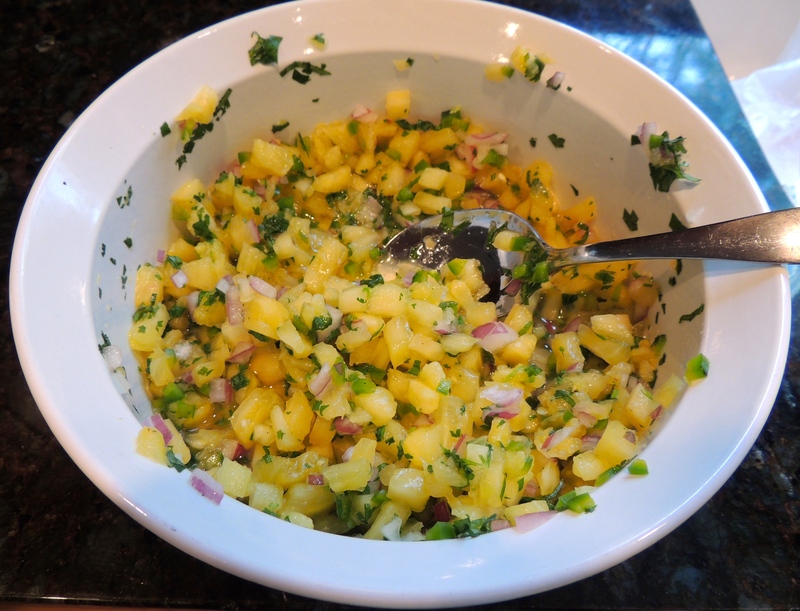 Combine the pineapple, lime juice, green onions, cilantro, jalapeno, and salt. Let sit 30 minutes, stir once at 15 minutes. Can be made up to two days in advance. Most fishmongers clean and devein the shrimp for you. If possible, get them to remove the tail shell, too. If you don’t have a grill, heat a medium sauté pan over medium-high heat and sauté the marinated shrimp into the hot pan and cook as directed below. 1/8 teaspoon crushed red pepper flakes, more if you dare! 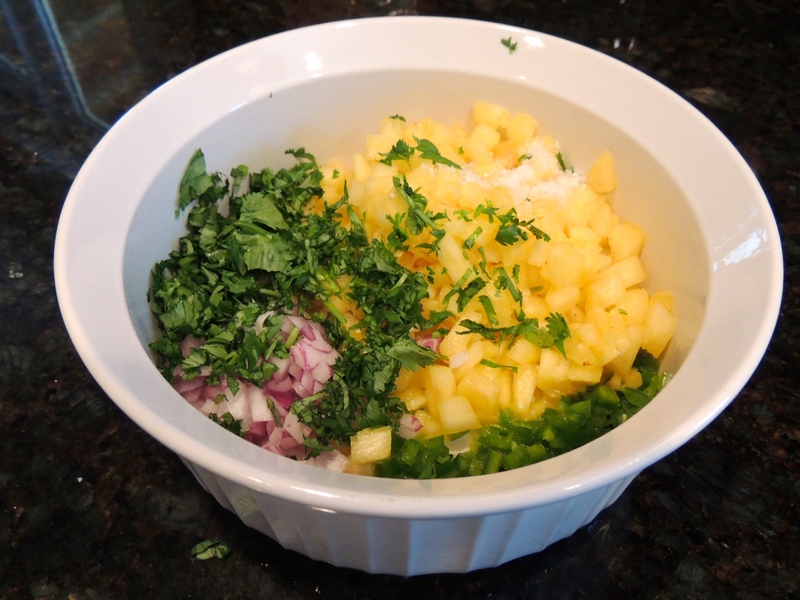 Combine the pineapple, lime juice, green onions, cilantro, jalapeno, and salt. Let sit 30 minutes, stir once at 15 minutes. Note: Salsa can be made up to two days in advance. Top each shrimp bite with a little salsa. 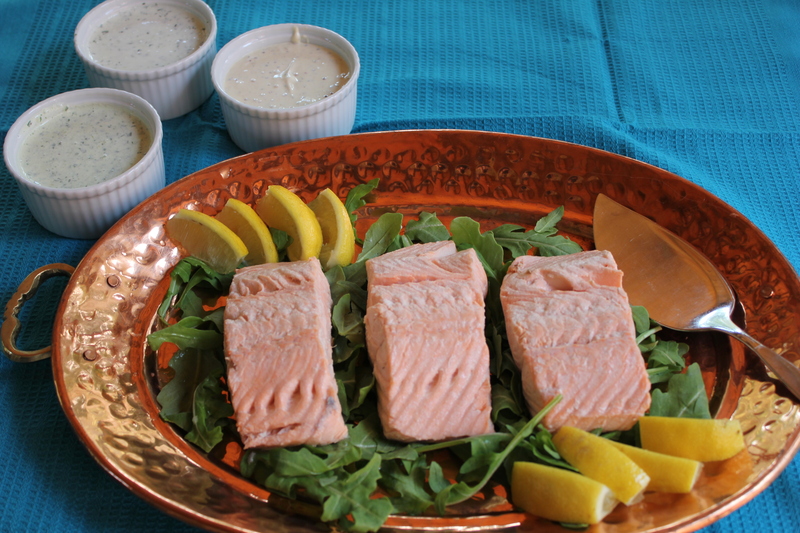 I love cold poached salmon and it’s the perfect vehicle for a variety of delicious sauces. I couldn’t decide between a cucumber dill, my favorite, a mustard or something with a bite like watercress. 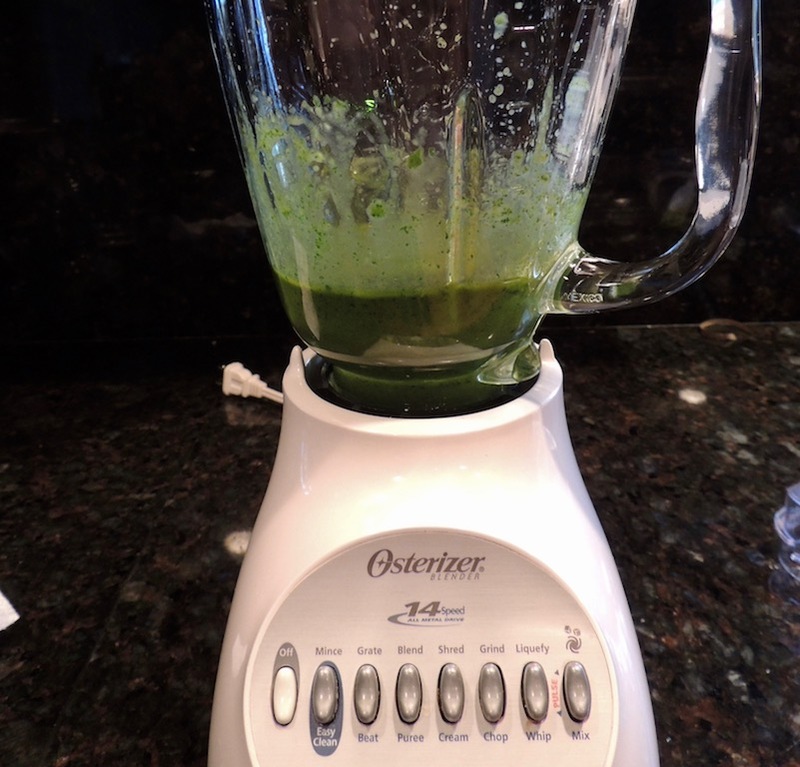 Since watercress isn’t in season, I substituted arugula and added some cucumber and a touch of lemon zest. That’s how I ended up with Poached Salmon with Three Sauces! The irregular shape of salmon presents a challenge to even cooking. I removed the thin edge along the length of the salmon and poached it as a separate piece for four minutes and cut the rest of the salmon into six equal portions, which I poached for seven minutes. A rich poaching liquid adds depth of flavor to the salmon. Place the wine in a medium saucepan, bring to a boil and reduce to ½ cup. Add the aromatics and cold water, bring to a boil, lower the heat to a gentle simmer and continue cooking for half an hour. Strain and thoroughly chill the poaching liquid. Both the fish and the poaching liquid must be the same temperature at the start of cooking to cook the fish evenly. Use a gentle simmer to prevent the vigorous bubbles of boiling liquid from breaking apart the salmon, it’s very fragile. A delicious assortment of sauces to complement poached salmon. Place the wine in a medium saucepan, bring to a boil and reduce to ½ cup. Add the onions, carrots, celery, garlic, salt and peppercorns and water to the saucepan and bring to a boil, lower the heat to a simmer and continue cooking for 30 minutes. Strain the poaching liquid and discard the vegetables. Chill the liquid thoroughly. Place the prepared salmon in the bottom of a pan large enough to hold all pieces. Pour the cold poaching liquid over the fish to cover completely; if necessary add a little water to make sure the tops of the salmon are submerged. 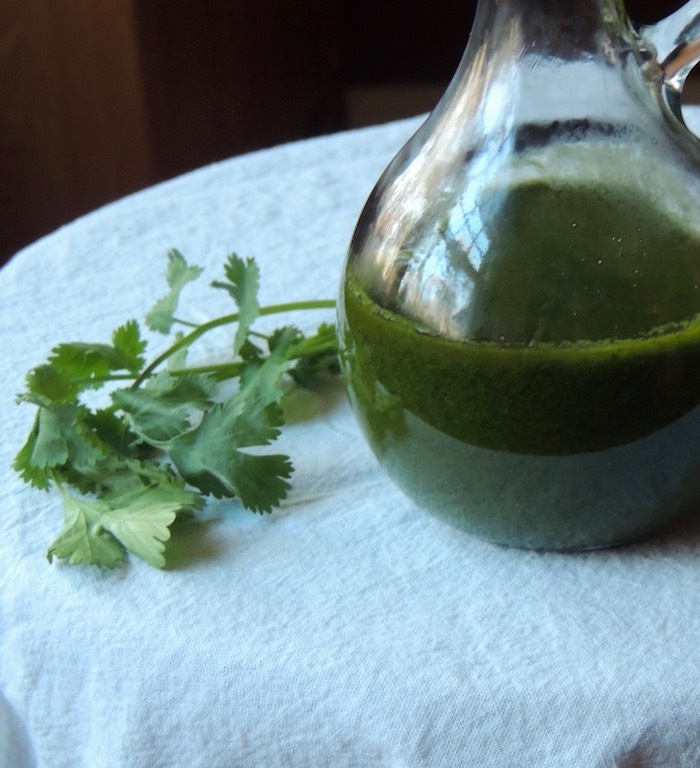 Bring to a boil and immediately reduce the heat to maintain a very gentle simmer; cook for 7-8 minutes. Whisk all the ingredients together and refrigerate for at least 30 minutes to let the flavors meld. Can be made up to 3 days in advance. 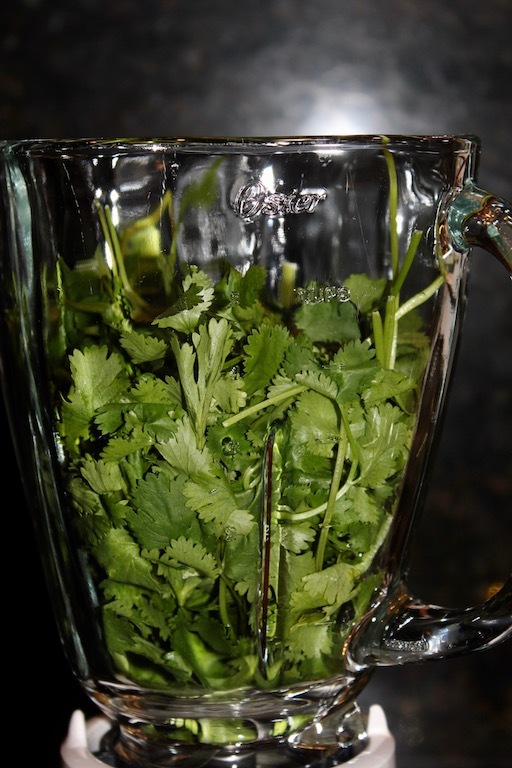 Place the ingredients in the base of a blender or food processor and puree. Refrigerate for at least 30 minutes to let the flavors meld. *Slice the thin edge that runs the length of the salmon. Poach for 3-4 minutes. 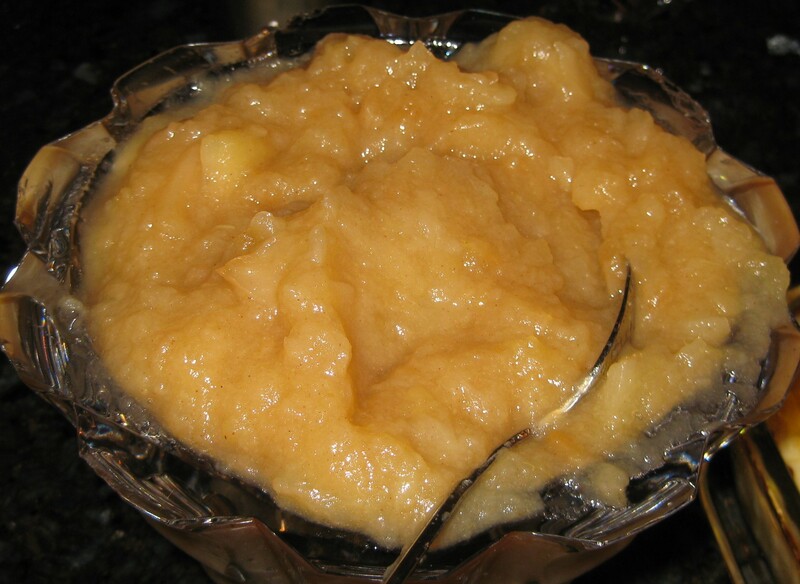 applesauce on the other hand is a proven success for many years. Applesauce is one of the easiest recipes to make and one I taught every semester in the first week of our food lab at NYU. I hope none of my students ever purchased jarred applesauce again! Purchase a mix of at least 3 varieties, such as tart Granny Smith, sweet McIntosh and Golden Delicious with its honey-like overtones. 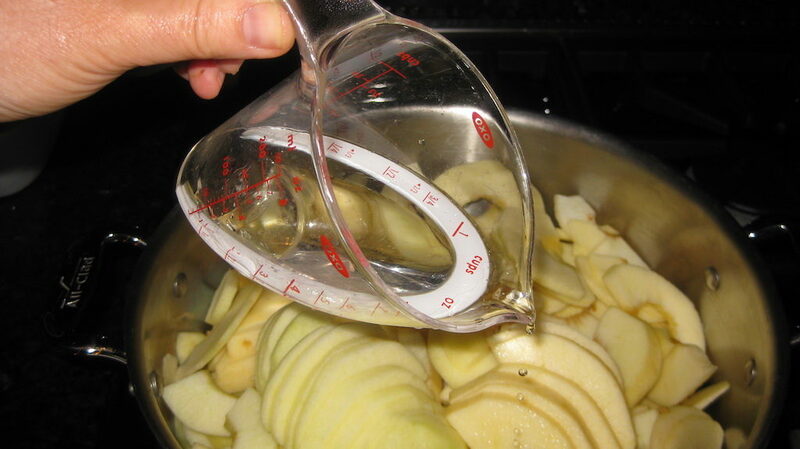 There are two methods for making applesauce. The first is good for a small batch, the second for large batches. 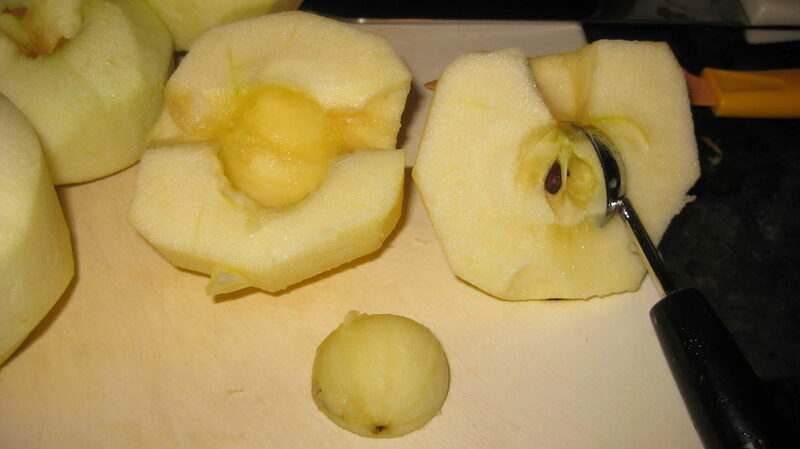 Peel, core and cut the apples into chunks – the smaller the pieces the faster they cook down. Pop these into a covered sauce pan with 1/4 cup cold water. Turn the heat on low and stir occasionally Once the apples begin to break down turn the heat up a little. The apples are ready when easily crushed against the side of the pan with the back of a wooden spoon or spatula. Mash and season with ground cinnamon. Wash the apples and cut into chunks – the smaller the pieces the faster they cook down. Pop these into a covered sauce pan with 1/4 cup cold water. Turn the heat on low and stir occasionally. Once the apples begin to break down turn the heat up a little. The apples are ready when easily crushed against the side of the pan with the back of a wooden spoon or spatula. Ladle small batches into a food mill placed over a large bowl or saucepan and process to remove skins, core and seeds. Scrape the food mill clean between batches. Season with ground cinnamon. Applesauce is best served warm, nuke in the microwave for 30 seconds, stir and nuke again. 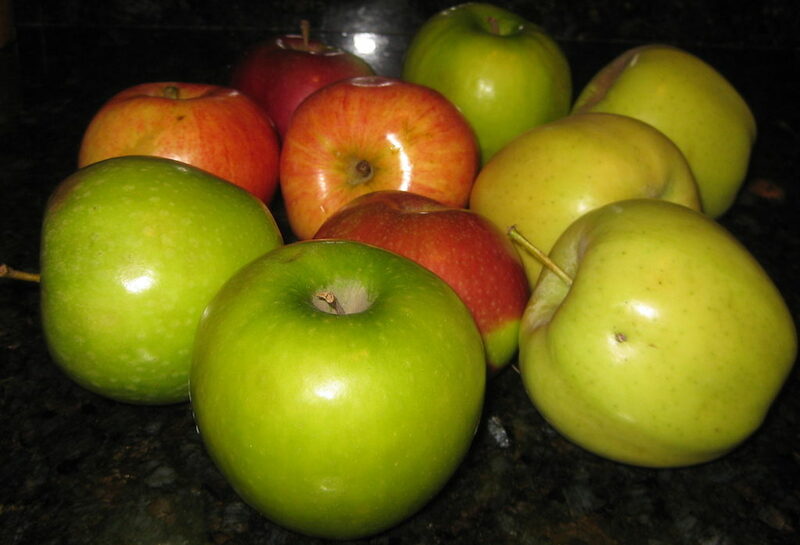 Use a variety of apples, such as Granny Smith, McIntosh and Golden Delicious, for a complex tasting applesauce. Peel, core and cut into chunks – the smaller the pieces the faster they cook down. Pop these into a covered sauce pan with 1/4 cup cold water. Turn the heat on low and stir occasionally. Once the apples begin to break down turn the heat up a little. The apples are ready when easily crushed against the side of the pan with the back of a wooden spoon or spatula. Mash and season with ground cinnamon.